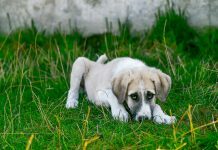 It’s common for a dog to lick their paws, however, when it happens too much there must be a problem. A dog who is constantly licking or chewing paws can be showing signs of an infection, allergies or even boredom. Paws are very sensitive and even the slightest of infection can cause them to crack and produce a lot of discomforts. Besides the nose, dogs do sweat from the bottom of their feet. This creates conditions that are very conducive to bacteria and pests to flourish and cause the paws to itch. Apart from being irritating, licking of paws can infect the dog with diseases picked up as they were walking. Luckily you can easily get rid of this habit at home using simple, affordable and non-toxic remedies. 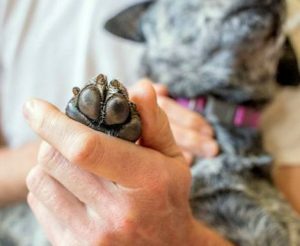 Here is a list of ten remedies that can be used to relieve itchiness and cracked dog paws. Soak the paws in vinegar. cause your dog to chew their paws. Vinegar has a lot of anti-fungal properties that stop such infections. Simply mix two cups of warm water and a cup of vinegar in a basin and soak the dog paws in the water for five minutes. Repeat this twice a day for a week or until the dog stops licking its paw. Soak paws in water mixed with baking soda. Baking soda has a lot of uses in and out of the kitchen including treating itchy dog skin and paws. It has a lot of anti-inflammatory properties that reduce itchiness and swelling. A dog steps on many things as it walks, this can increase acidity levels on the paws and cause itchiness. Baking soda has a low PH that helps to neutralize these acidity levels and reduce itchiness. Make a paste using one spoon of baking soda and apply on the paws and then wash after a few hours. Baking soda is easily available and does harm the dog. Soak the paws in Iodine. As your dog walks it does get a lot of small bruises on the paws. 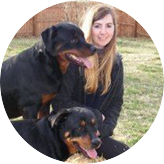 Germs and fungus may take this opportunity and invade your dog’s paws and cause itchiness. Iodine has anti-bacterial and anti-fungal properties that disinfect the paws and stop the itchiness. You can soak a sponge with some iodine and then gently wipe the paws with the sponge. You can also mix some iodine and warm water then soak the paws for five minutes. 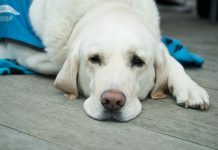 Lack of vitamin E in dogs causes a dogs skin and paws to dry up. This may cause your dog’s skin and paws to itch, this makes your dog to scratch and lick its paws regularly. Vitamin E’s anti-oxidation properties help in the removal of toxins from the cells and help heal dry skin and paws. Besides, that vitamin E is good for your dog’s heart, liver and improves the immune system of the dog. You simply extract some oil from the capsules and apply it on your dog’s paws until the paws stop drying and cracking. 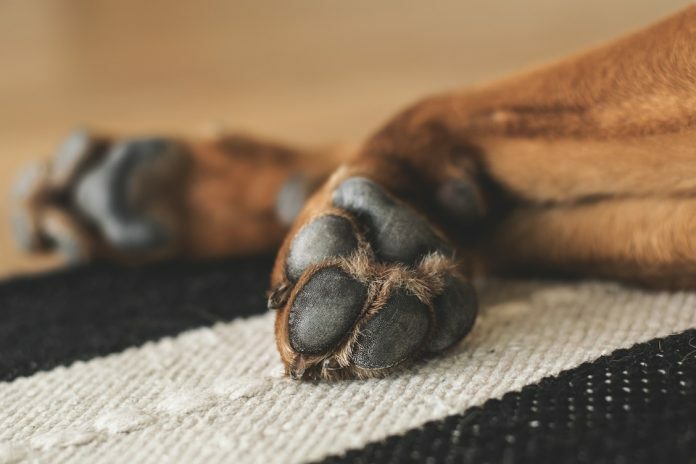 As stated above injuries on dog paws are very common. Bacteria may attack these wounds and start causing them to itch. Epsom salt has anti-bacterial properties in it that help to disinfect dog paws and relieve it from itchiness. Dilute some Epsom salt in warm water and soak the paws in the solution for a few minutes and then wipe the paws. Repeat this until you get your desired results. However, do not let your dog drink the water because it may a cause stomach upset. Apply some honey on the paws. Honey has a lot of properties that are beneficial to a dog. Honey moisturize’s and softens dry paws hence helps to soothe itching paws. Honey is a good anti-oxidant that helps in the removal of toxins from cells there for encouraging regeneration of new cells. It has antibacterial properties that kill bacteria and keep infections on the paws at bay. Honey also helps in treating different types of allergies including those that cause paw itchiness. Simply apply raw honey on the paws or you could mix it with vinegar or baking soda in order to get better results. Wash the dog with Chamomile. Besides being used by us to relieve stress, chamomile has a lot of properties that are extremely beneficial to dogs. Its anti-bacterial properties help disinfect injured paws while at the same time helps to relieve itchiness and inflammation. Chamomile has anti-oxidant properties that encourage removal of toxins from the cells. Chamomile can be mixed with vinegar and used to soak the dog’s paws. It can also be mixed into a dog’s diet. Massage dog paws using coconut oil. Dry paws cause dogs to lick paws in order to relieve itchiness. Coconut oil contains fatty oils helps to reduce this dryness and moisturizes the paws. It can be used on wounds to kill bacteria and promotes faster healing of wounds because of its anti-bacterial properties. Coconut oil is not harmful to dogs and can be used to treat many other dog ailments. Coconut oil can be mixed with other remedies such as baking soda or vinegar in order to get desired results. It is simply applied on the paws or can be mixed in a dogs bath water or even diet. They say prevention is better than cure. By cleaning and drying your dog’s paws regularly you ensure that you do not create conducive conditions for bacteria or fungus to flourish. You need to also physically inspect the paws for any solid particle that may be causing discomfort to your dog. Another thing people need to be aware of allergies because they also cause itchiness and causes dogs to chew on their paws. In case you try all forms of home remedy and they fail, you are advised to seek help from a qualified veterinary doctor. Next articleHow to stop dog from eating poop!